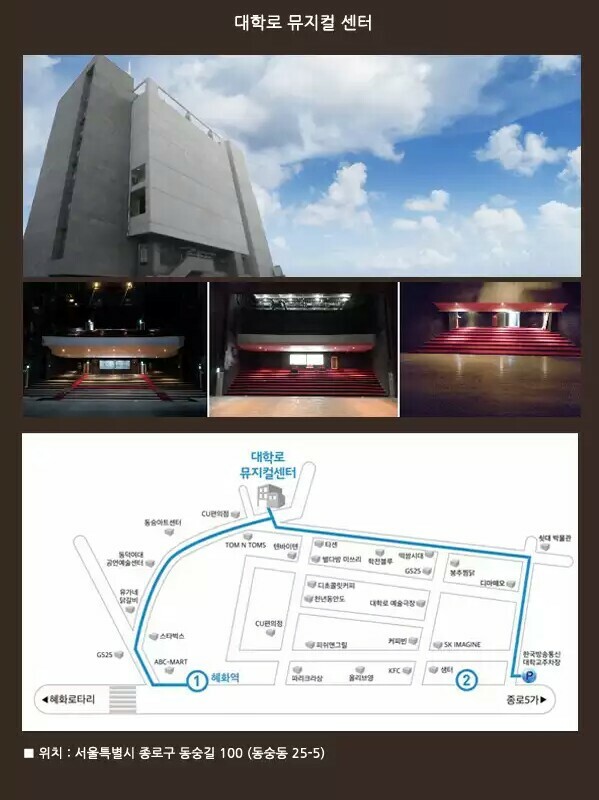 17 Nov update: Glorious Entertainment has released ticketing information about the event. 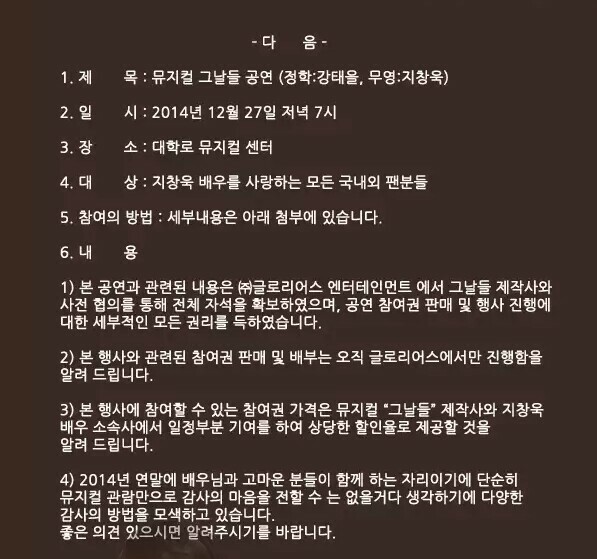 Please refer to the notice on their site for details. 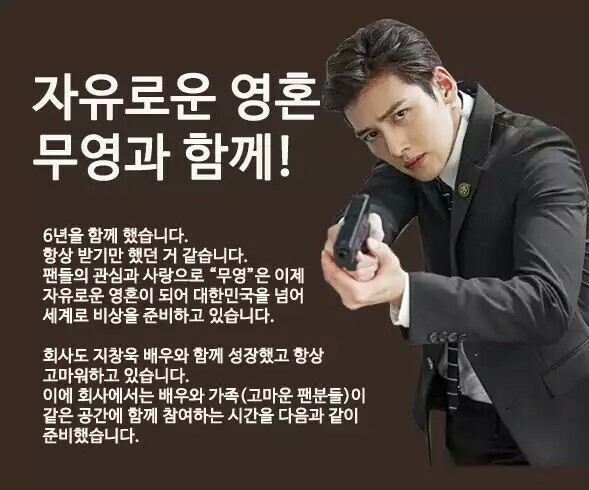 Glorious Entertainment is holding a special performance of “The Days” for fans of Ji Chang Wook to thank everyone for supporting him the past 6 years, and also as a sign of appreciation for him because the company has grown along with him. How to participate: Please see below for details. Glorious Entertainment has reserved all seats for this performance in collaboration with Insight Entertainment (the company producing the musical). Glorious holds the rights to the sale of participation tickets and this event. Only Glorious holds the rights to the sale and distribution of participation tickets for this event. The price of tickets to this event is partially subsidized by Insight Entertainment and Glorious, and tickets will be sold at a discounted price. We wish to thank everyone by allowing all to watch the musical together, but we believe this is not the only way that we can express our thanks to you. We are currently thinking of other possible ways, so do let us know if you have any good suggestions. Each person can only purchase two seats. Seats are divided between first and second floors. 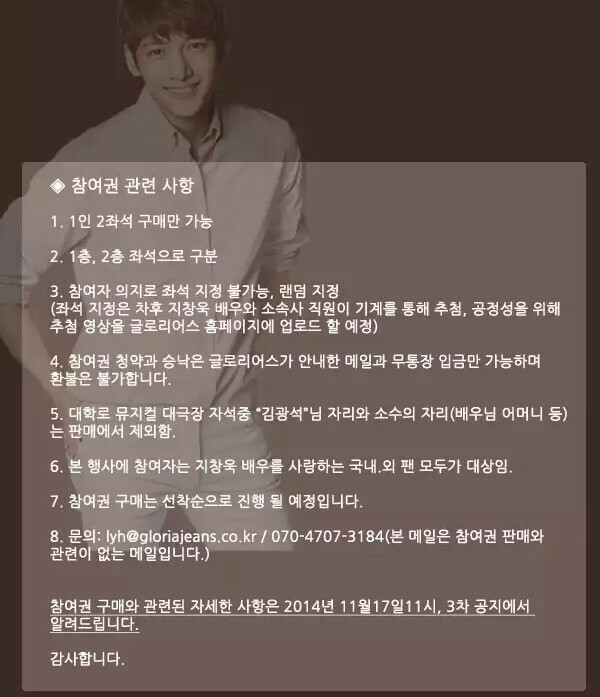 This event is meant for local and foreign fans of Ji Chang Wook. The sale of participation tickets will be done on a first-come-first-serve basis. Contact: lyh@gloriajeans.co.kr or call 070-4707-3184 (this email has no relation to the sale of participation tickets). Details of the sale of participation tickets and related matters will be announced in a third notice at 11am on 17 November. Seats marked in red are required by the actors and for filming. Thank you for your translatation and I will share in thailand fanpage with thai trans. Thank you for nice Glorious post English version now for foreign fans who can’t read Korean also want to participate in Ji’s special fan event. Lovely idol Chang Wook is so blessed to have such a thoughtful company. Thank you for your great job as always! Nice to see that Glorious is carrying about the foreign fans now even if we have to be able to read Korean to participate. I’m wondering if the tickets sale will start on November 17th.